Between 5% and 16% of Australian children struggle with anxiety disorders each year, and most statistics suggest that the number of anxious children is steadily rising. Anxiety doesn’t just make life difficult for your child; it can cripple your entire family, turning the morning routine into a nightmare, giving rise to endless tantrums, and making even a simple doctor’s appointment into an exhausting chore. Anxiety is a real medical condition no different from diabetes or asthma. It’s not something your child chose, and punishing your child for anxious behaviour will only make the problem worse. Likewise, if your child is anxious, it’s generally not your fault or something you caused. There are, however, things you can do to reduce your child’s anxiety, avoid exposing him or her to traumatic events, and help your child grow into a confident and anxiety-free adult. It’s easy for adults to forget how very little control children have over their own lives. Imaging how anxious you’d feel if you couldn’t decide what to wear, what to do, or when to go to bed. Children experience similar emotions. While you can’t allow a young child to direct his or her own life, you can give your child more choices. Only exercise your parental authority when it’s necessary for your child’s health or safety. Trying to control every aspect your child’s existence only stymies creativity and encourage anxiety. Particularly if your child is prone to fear, you might be tempted to restrain your child to keep him or her under control—especially at the doctor or dentist’s office. But restraining a frightened child can have long-lasting psychological impacts. Indeed, much research suggests that many phobias begin when a child is restrained. Instead, try reasoning with your child and offering a reward. Research consistently shows that children who grow up in unstable, abusive, or otherwise stressful homes are significantly more likely to experience anxiety and other mental health problems. You can’t control everything that goes wrong in your own life, but you can control how it affects your child. 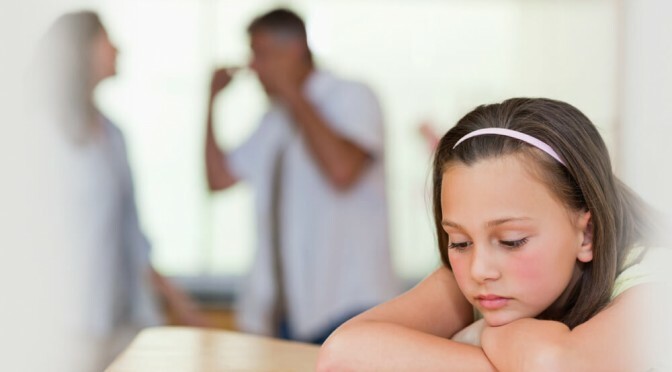 Don’t fight in front of your child, or use your child as a pawn in your divorce. Be consistently affectionate, with clear and predictable rules and reasonable punishments. Children who feel safe at home, who know what to expect from their parents, use their family as a secure base from which to explore the world, allowing them to become progressively more independent—and increasingly less anxious. It’s tempting to try to use your role as a parent to make your child in your own image. Liberal parents want liberal children; religious parents want religious children. This strategy, though, can backfire when your child disagrees with you. Don’t force your child to adopt your opinions on everything. Instead, encourage him to speak his mind. When she differs from you on an issue small or large, praise your child for her thoughtfulness and highlight how important critical thinking skills are. Sure, it’s not easy when your child disagrees with you, but respecting different opinions—even when those opinions are about you or your rules—is a hallmark of mature adulthood. Children who are able to share their ideas are more likely to grow into confident adults. Psychologists generally recognize two dimensions of parenting: warmth and control. Very controlling parents who aren’t very warm are called authoritarian parents. They constantly punish and control their children, and may have children who develop severe anxiety. Very warm parents who don’t have any rules are called permissive parents; their children, too, may struggle with phobias and anxiety. But authoritative parents have lots of rules and offer lots of love and affection. This ideal parenting style promotes strong mental health, and can reduce your child’s risk of anxiety, in addition to promoting her psychological, social, and intellectual growth.